The US Federal Reserve has kept its $85bn-a-month bond buying in place, in an effort to keep borrowing costs low and bolster the economy. 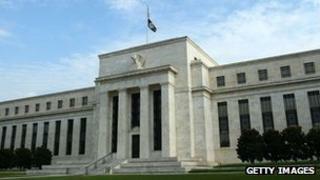 The central bank's rate-setting Federal Open Market Committee also kept its key interest rate at zero to 0.25%. It said unemployment remained too high for a change in its quantitative easing policy. The US economy rebounded in the first quarter to grow by 2.5%, but was still below expectations. The Federal Reserve uses quantitative easing, a policy of buying bonds, to increase the money supply and improve liquidity in the financial system in the hope of sparking economic growth and supporting employment. Until recently, analysts had expected the Federal Reserve to reduce its quantitative easing programme, known as QE3, in the second half of this year, but now many are not so sure. "Expectations for tapering off of the Fed's outcome-based purchases have been pushed back due to recent softening in the economic data," according to a statement from the private sector Treasury Borrowing Advisory Committee released on Wednesday. Paul Ashworth, chief US economist at the research body Capital Economics, said the Fed's language left the door open for the QE3 programme to be increased, as well as wound down: "The fact that the Fed felt it necessary to point out that the pace of purchases can be adjusted in both directions presumably means that, at the very least, it is less inclined to slow the rate of purchases any time soon. "We still expect the Fed to begin curbing its QE in the second half of the year, but now probably not until close to the end of the year." US private sector employers added just 88,000 people to their payrolls in March, it needs to add more than twice that amount to maintain employment levels because of population growth. One sign of positive economic growth is in the housing sector, with house prices still buoyant by recent standards, but elsewhere figures showed that factory activity in the US barely grew in April.